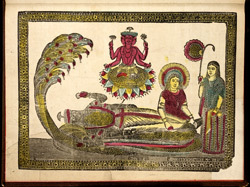 This image comes from a set of 35 printed and coloured illustrations of the Hindu epic stories, the Mahabharata and the Ramayana. They were made in Calcutta during the 19th century by artists including the famous engraver, Madhav Chandra Das, who produced this picture. Each illustration has the artist's name in Bengali incorporated into its bottom border.